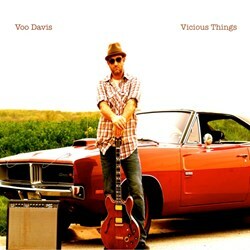 "Vicious Things" is the highly anticipated sophomore album by blues guitarist, Voo Davis, that will leave you enveloped in emotion, is scheduled for release today, September 10th, 2013. Voos previous basement-recorded release, A Place For Secrets, spent seven months running through the AMA & Roots Music Report charts respectively, while surprising the Blues/Americana music scene with an overdriven acoustic mix of slide based guitar songs. After taking up the guitar at age 19, Voo began playing solo gigs at only 21 years old; he has since performed with Chicago Blues legends Eddie "The Chief" Clearwater and Chico Chism, among others. A former member of the band Loose Change, Voo is known for his aggressive and dynamic stage presence and classical technical abilities. Nicknamed Voo due to his vast knowledge and ability to play Jimi Hendrix on command, Voo lists his namesake along with Buddy Guy, Martin Sexton, and R.L. Burnside as vital influences. Vicious Things is a fresh, new collection of songs arriving just a year after the release of Voos highly acclaimed debut. Lyricism is of equal importance to the music on Davis new album, presenting a true artistic talent as he seamlessly combines both. The songs are able to speak for themselves in an organic way, and the result is a reflection of numerous styles, personalities, and instruments. With Vicious Things, the award winning, former blues circuit guitarist has moved from the basement to two of Louisianas top recording studios--Studio in the Country and Dockside Studio--and added four other Chicago based musicians: Stephen Bores (Bass/Ukelele/Vocals), Calvin Conway (Harmonica/Fiddle/Vocals), Jon Wade (Keys), and Mike Gock (Percussion). Vicious Things, produced by Voo, himself, was recorded on analog Neve boards. No autotune, no big computer fixes, just humans making sounds-- a trait that Voo learned on the road with WC Handy award winner Eddie King. With a passion for lyrics and a gift for creating emotion with a guitar, Voo Davis encompasses all that is right about an independent musician in todays field of millions. Vicious Things brings genres together instead of separating them into a neat package of similarity. Its a real album in a time of one song releases. For more information, images, or to arrange for an interview with Voo Davis, please contact Melissa Zeigler at Powderfinger Promotions: melissa(at)powderfingerpromo(dot)com. Powderfinger PromotionsIndependent Radio Promotion and Publicity. Since being founded in October 1994, Powdernger has come to be regarded as a top indie radio promotion and publicity rm with ties across North America.